Along with my exercise, makeup, and hair routine, I get asked about my skincare routine just as much, if not more than anything else. A lot of my followers know I don’t wear much makeup, if any at all, so having good skin is really important to me. I’ve been blessed to never have gotten pimples or acne in my life- nor do I have any sun spots or blemishes on my face. I’ve always kept my skin care routine simple. I make sure to wash my face and moisturize every night, and in the morning I lightly rinse my face and moisturize with SPF usually. I’ve previously blogged about my daily skincare routine using a few of my favorite products, and I wanted to share what I’ve been using recently. 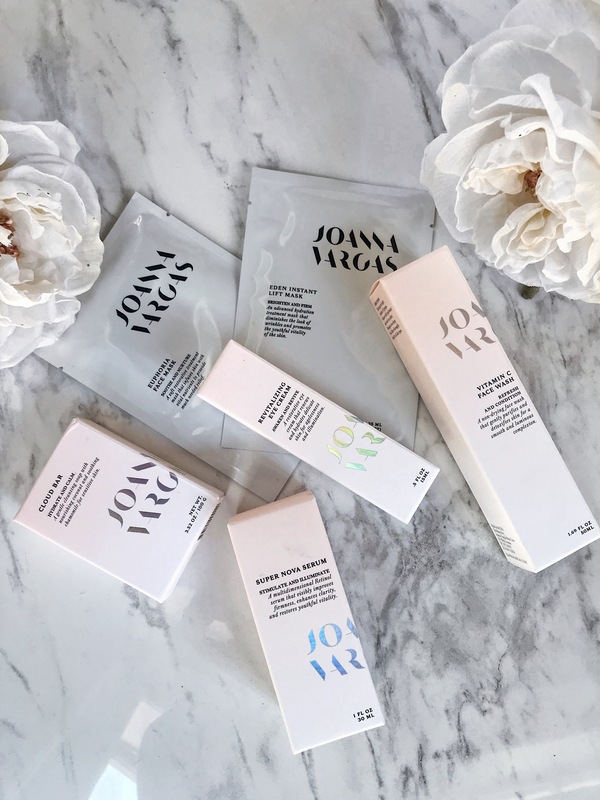 I’ve been using Joanna Vargas skincare products for the past couple months and have been really liking them. I am on a one month long trip in Europe at the moment and brought her products along with me to continue my at-home daily skincare routine. Below is my current routine with the product breakdown! ~VITAMIN C FACE WASH– One of the most important things for your face is Vitamin C. I am big on taking off my makeup and washing my face every night- you will never find me passed out with my makeup on…ever! I take off my makeup with a makeup wipe, then use the Vitamin C face wash to gently remove the excess grime and daily pollutants my skin faces every day. Vitamin C is crucial for your skin, and this one is also made with Acai, Goji berries and citrus oils for the perfect skin cleansing combo. My skin always feels refreshed, squeaky clean and glowy after I use this and it makes me feel confident to know I’ve really gotten everything off my face! ~REVITALIZING EYE CREAM-One of the things on my face I am a little self conscious about is my under eyes. It might be because I have Middle Eastern blood, or could be my lack of sleep, but I have dark circles and a deep indent under my eyes. I crave a good eye cream that brightens, de-puffs and hydrates. This one has a Shea and cocoa butter base to moisturize, hydrate and smooth the skin, and sweet potato to de-puff and rejuvenate. I can’t live without a daily eye cream, and I’m really liking this one. ~ SUPER NOVA SERUM- Said to be the most effective treatment in the Joanna Vargas collection, the Super Nova serum is what her collection is known for. This Retinol serum is a powerful skin soothing treatment that restores youthful vitality. Reducing fine lines, increasing firmness, and enhancing clarity, this serum gives you younger looking skin. A few key ingredients such as Vitamin A, Fatty acids, and Chamomile help soothe the skin. After cleansing my face with the Vitamin C wash, I apply the revitalizing eye cream and use the Super Nova serum at night, and only a few times a week. Because I don’t have any major skin concerns, I don’t use it everyday because retinol formula is powerful. I’ve only been using this product for a few months but I can feel a difference in my skin. Sometimes my skin feels dull and this really makes my skin look glowy and feel tighter. CLOUD BAR- I don’t travel with this, but I also use the Cloud Bar soap to wash my body in the shower. Made with coconut and chamomile to sooth and nourish the skin. FACE MASKS- I’ve also tried two face masks from her line- the Euphoria face mask which infuses the skin with vital nutrients, and the Eden Instant Lift Mask to brighten and firm. I tend to like hydrating masks, and these were great because it didn’t feel like it dried my skin out. In addition to her products, Joanna Vargas is known for her facials and has spas in Los Angeles and in New York. Surprisingly I’ve never had a facial in my life, but I am going in soon to get one for the first time! I’ve always declined getting facials and been nervous to start getting them because I’ve felt it was better to just leave my skin alone if I didn’t have problems, but I’ve heard amazing things about her facials and I am going to try her signature- the Triple Crown facial that several celebs do before hitting the red carpet for glowy skin. I will keep you posted on my skin before and after the facial! If you are interested in trying any of the products, you can get 20% off using my code NICOLE20 on www.Joannavargas.com. Thanks, Nicole – I’ll try it. My skin needs this!